Basically, these are just low-growing shrubs. Usually they have one main stem that branches above the ground to form a bushy, mound-shaped plant. Some kinds of subshrubs are mainly woody just at the base, with the ends of the branches dying back during the winter. Subshrubs grow much more slowly than regular taller shrubs, so they don’t require much pruning. 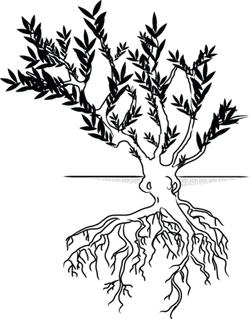 Pruning just involves removing any dead stems or stem tips in the spring, when the plant forms leaves. There usually is no need to do an overall pruning to shape the plant, since these are by nature already compact in habit. Some kinds are mainly grown for foliage interest while certain ones have very showy blooms. Some are evergreen and some are deciduous in winter. Because these usually only have one main stem at the base, they are impossible to increase by dividing. Subshrubs are usually propagated by cuttings. Best used as specimens or in small groupings. Subshrubs provide much-needed height and structure in a rock garden, yet they still stay in scale with their surroundings. Subshrubs give you something to look at in the winter months, either evergreen foliage or interesting shapes from the woody stems. Surround a subshrub with a flat carpeting plant, or a spreading alpine. Not especially suited to growing in walls, except for types with a cascading habit. These can be useful in alpine troughs or containers, but at some point they may grow too large. Just move them to a spot in the rock garden at that time. 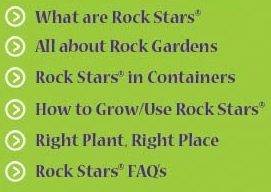 To see different Rock Stars® that are subshrubs, try using our Advanced Search to locate them quickly and easily.